When you stop drinking alcohol, there’s a host of benefits that you can begin to experience. 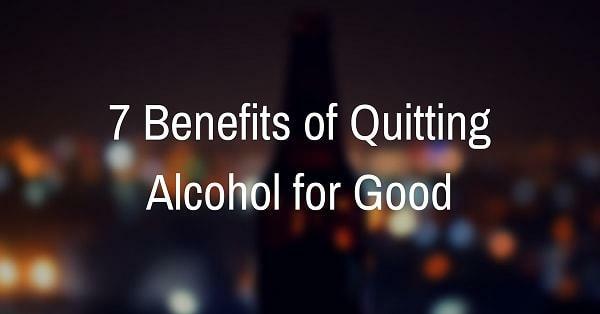 Here are some of the benefits of quitting alcohol that you can look forward to as life as a non-drinker in the event you’re considering stopping alcohol for good. Please note: It’s super important that you speak with your Doctor before you make any change to your health. If you’ve already done so, and wish to speak to Barbara about potentially entering rehab for alcohol abuse, please call her or the team direct on (03) 9826 0949. You Can Actually Remember The Night Before! The problem with being a regular drinker is that it’s easy to forget important dates, events and obligations. If you drink on a regular basis, you’ve probably been characterised by your loved ones or friends as the forgetful one. When alcohol is the central focus of your life, everything else can melt away. If you’re exploring the option of a rehab to help you stop drinking, you’ve probably experienced the worst kind of memory loss that occurs when you drink alcohol. The type where you wake up feeling deeply regretful, worried and concerned that you can’t remember the night before’s antics. The critical thought: “What did I do last night?” is a horrible question to answer when you can’t because you don’t remember. When you stop drinking alcohol permanently, you will never have another morning of shame again. You will remember everything. Having clarity around events at birthday parties, family gatherings and work events will be the permanent norm. Never again will you have to wake with that sickening dread, concerned about drunken behaviour (and a hangover). Aside from remembering everything, you will never have to deal with another hangover. Those days will be gone too. Remember all the hangovers you’ve experienced, the headaches, the nausea, the lethargy, the darkness? Gone. I noticed as I hit my thirties it took longer to recover from drinking sessions. Hangovers would seemingly last for days. They would affect my productivity, my income and energy levels. Any hangover would also reduce the likelihood of hitting the gym for some time. The minute I stopped drinking, was the minute weight loss started and energy increased. Since you have more energy because you’re not dealing with hangovers, you can utilise this extra energy for healthier activities like physical exercise. When you combine this with a dramatic drop of calories because you are no longer consuming calorie loaded alcohol, most people notice a dramatic drop of weight. You are likely to lose weight. When you have a new beginning of quitting alcohol, you have a powerful opportunity to completely change your life. Potential exists again. How will you use it? I used it to work out every day which is something I never thought I would do. When you quit drinking, it won’t take long for you to start looking younger. The alcohol tiredness and eye bags will be gone and energy will increase that will radiate through your complexion. This is often noted. Most people drink alcohol because it’s a learned mechanism to deal with current and or former stress. When you decide to stop drinking with assistance from your doctor, it’s recommended you find positive outlets and habits to deal with stress. It’s much easier to switch a habit to something else like going to the gym, than just stopping something completely. Suddenly when you stop spending hundreds of dollars on alcohol every month, this money starts showing up in your bank account instead. If you’ve been spending $400 a month on alcohol, that’s $4800 per year. With compounding interest at a moderate 3% interest rate return, after 10 years, you will have saved over $55,897. That is not a low number. Also, the thing with being drunk half the time is that you’re not only buying drinks to get drunk, you’re buying a heap of accessory stuff like takeaway and calorie loaded food and taxi fares. All of this extra negative financial baggage will stop the minute you stop alcohol. You will noticed this. When you stop making alcohol a central focus, you suddenly have more time. And more time with energy. With this, you have the ability to focus on things that bring you real wealth, not just financial. What were some of the things you did as a kid? Did you play sport or collect football cards? Did you make dresses or draw? These enriching activities can be brought back into your life. For a lot of people who stop drinking, they can become a little anxious with the extra time they suddenly have. This is why it’s important to replace your former drinking time with positive behaviors like going to the gym, learning how to sew or building something in the garage. Other activities to take the focus off the fact that you’ve stopped drinking. Those that switch to other things consciously are generally more successful in the long term than those that stop without any plan of replacement. For the most part your relationships will significant improve. Your partner, if you have one, will probably be satisfied. He or she will be in a state of appreciation for your decision. Since you’re not creating havoc in the world anymore, you’re likely to significantly reduce unpleasant situations with friends and family. Suddenly you stop being the drunkard. One the things that can be tough is how you might change around people that were associated with your former alcohol life. They may actually treat you negatively because you have made the change and they haven’t. Your success represents their failure. This isn’t realised consciously. It may simply manifest in their behavior towards you. This should be noted and prepared for. Stopping alcohol is certainly not easy, and may require a consistent focus for the rest of your life. But the rewards are amazing. The actor Rob Lowe and actress Jamie Lee Curtis both said that getting sober was the best thing they could have done for their lives. Hundreds of people that have gone through Refocus through the years have said the same thing. I gained all of the above and more. My life is better. I’m happier and I’m more likely to float through days than be crushed internally with guilt and pain that were both caused by drinking alcohol and its ramifications. Barbara from Refocus asked me to write this. She helped me get sober and I’ll be appreciateive for it for the rest of my life. If you are intending on stopping alcohol, please consult with your GP. If you would like to talk to Barbara about going to rehab, to make the translation, please give her a call on (03) 9826 0949.